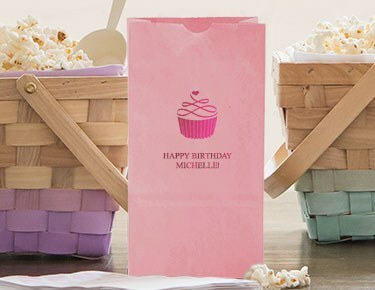 Explore our great selection of self-standing paper favour bags in fun themes and colors that will take your party's candy buffet to the next level. 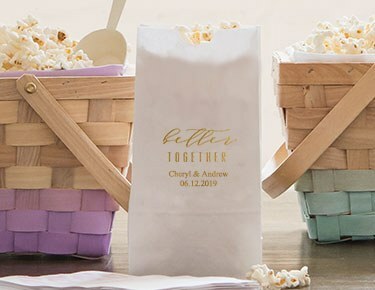 Give your guests a sweet treat and a personalized keepsake at the same time with fun favour bags that complement your occasion's overall décor and let them take some of the party home. 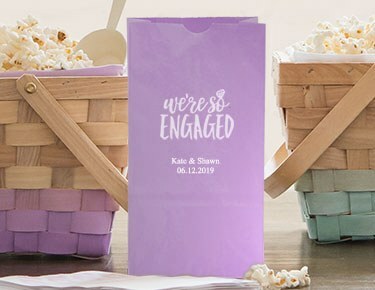 Whether you're throwing an elegant black-tie New Year's Eve party, a rustic barn wedding or a whimsical child's birthday celebration, you'll find the perfect paper favour bag to add the finishing touch in our large selection of colors, trendy themes and personalization options. 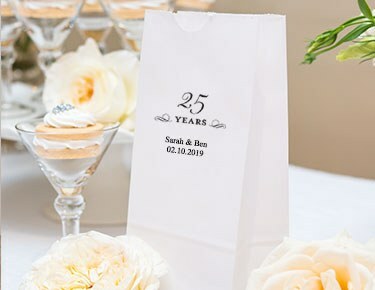 Set sail on a nautical-themed anniversary party, and your guests will love filling their favour bags with saltwater taffy from your dockside candy buffet. 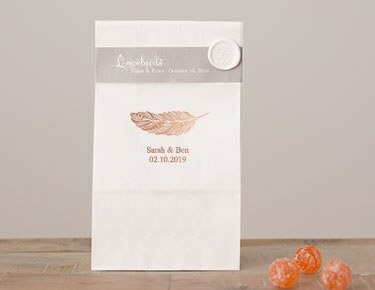 Or top off your teen's rock-n-roll bash with rock candy her friends can take home in a cool bag with her birthday printed on it. 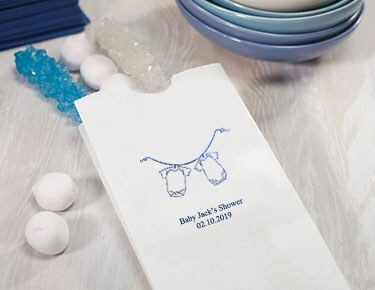 Or, keep it simple at a baby shower, bar mitzvah or family reunion by including favour bags on your candy buffet that reflect your shared sweet tooth. 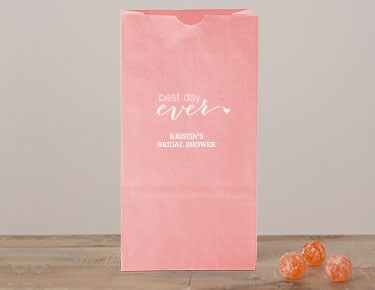 Self-standing bags can pull double duty for your party, making your decorating chores a snap. 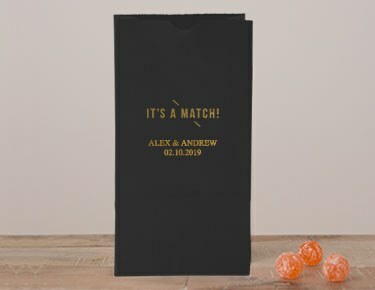 Go with our custom paper goodie bags and choose a single word, significant date or family name that sums up your reason to celebrate. Stand one bag at the center of each table, or place one at each guest's seat to make your tables look as festive as the candy bar that is festooned with garlands or balloons. 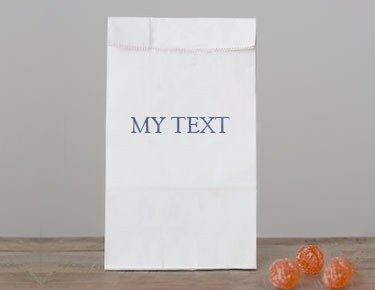 Additional lines of personalized text allow you to thank your loved ones for coming, remind them of the special occasion or encourage them to fill their favour bag with the sweet treats you have provided at the candy buffet. 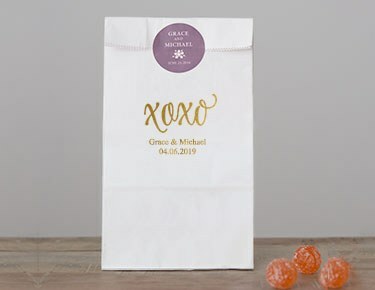 You'll find all the personalized favour bags and other party décor you need at Wedsy for those perfect final touches on your theme, and most North American orders over $99 ship free.